SEVEN SINNERS. Gaumont British Pictures, 1936. Released in the US as Doomed Cargo. Edmund Lowe, Constance Cummings, Thomy Bourdelle, Henry Oscar, Joyce Kennedy, Felix Aylmer. Screenplay by Sidney Gilliat & Frank Launder; story by Arthur Ridley & Bernard Merivale based on the play and novelization The Wrecker by Arthur Ridley. Director: Albert de Courville. Edward Harwood (Edmund Lowe): First I meet a dead man who’s alive and then I meet a living man who’s dead. Tankerton Agency detective Edward Harwood stumbles on a body in his hotel room in Nice during Carnival and as quickly loses it, and Caryl Fenton (Constance Cummings) the insurance agent sent to fetch him to Scotland to solve a case of missing jewelry is convinced it’s all part of an alcoholic haze, and hustles him off to Scotland. Until they are both victims of a train wreck on the Riviera Express where the corpse Harwood lost shows up as one of the hundreds of victims. 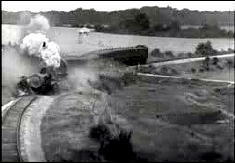 Learning from M. Turre, the Assistant Prefect of Police, that the wreck was deliberate Harwood and a reluctant Fenton are off to Paris and a trail that leads from an elegant Paris flat to London’s Guild Hall; to a small village in the West of England; to a man who died three years earlier but who they just met in Paris; to another train wreck to silence a doctor who falsified a death certificate; to the Pilgrims of Peace and a phony charity; and to a deadly confrontation on a train to Southampton where the Wrecker is determined to silence anyone who might lead to him — including Harwood and Fenton. 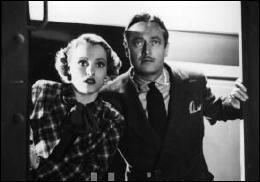 It should come as no surprise if this fast paced thriller reminds you of some of Hitchcock’s thrillers of the period, such as The Thirty Nine Steps and The Lady Vanishes, since screenwriters Sidney Gilliat and Frank Launder would go on to write and direct some of the best British films of all time. Among them, and rivaling Hitchcock in popularity and skills, are Green for Danger, State Secret (The Great Manhunt), The Lady Vanishes (with Alma Reville, directed by Hitchcock), The Green Man, She Played With Fire, Waterloo Road, and Belles of St. Trinian’s. Their last film was Agatha Christie’s Endless Night with Haley Mills and George Sanders in 1972. 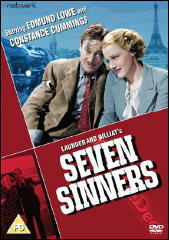 Seven Sinners, also known as Doomed Cargo when released in the US, is a fast paced, clever, and witty thriller with echoes of The Thin Man and first rate performances by Lowe and Cummngs. The film is based on the story (co-written with Bernard Merrivale), play, and novelization of The Wrecker by Arthur Ridley, a popular “barn burner” as such plays were known. 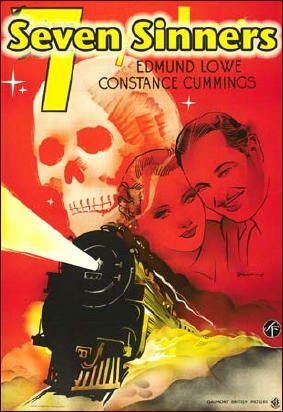 Ridley specialized in these, also writing Ghost Train, another “barn burner” that became a hit film and was also novelized by Ridley (remade as the hilarious Runaway Bus with Margaret Rutherford). Edmund Lowe seemed to specialize in detective roles, playing Nick Carter, Philo Vance, Lawrence Blochman’s Inspector Prike (changed to Dyke in Bombay Mail), and Chandu the Magician, starting in films in 1915 and ending with George Cukor’s Heller in Pink Tights in 1960. Along the way he was Captain Quirt in What Price Glory?, his biggest role, and appeared in such films as Dinner at Eight, The Last Hurrah, The Great Impersonation, Dillinger, and Mister Dynamite. He was sleuth/reporter David Case on early television’s Front Page Detective. 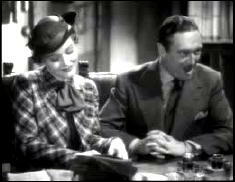 Constance Cummings played Harriet Vane opposite Robert Montgomery’s Lord Peter in Haunted Honeymoon, but fared much better in this and Blithe Spirit with Rex Harrison and Kay Hammond. Her scenes with Lowe have real crackle and snap to them, with a slight hint of the American screwball school well played by both actors. The train wrecks are well staged, and while there is some obvious model work and rear projection, they were state of the art at the time, and you can imagine the final train wreck with the train boring down head on had audiences jumping in the theaters of the time. It’s still pretty exciting stuff. The finale, a shoot out in a movie theater during a newsreel about the Wrecker, likely inspired the similar scenes in Hitchcock’s Saboteur and John Huston’s Across the Pacific. If it doesn’t exactly make a lot of sense it’s a well done set piece and a fitting ironic end as the Wrecker meets his fate while the newsreel announcer asks “Where is the Wrecker?”. One word of warning. When you are looking for this you are going to encounter the 1940 Tay Garnett John Wayne/Marlene Dietrich film Seven Sinners more often than this one. It’s a good film too, but nothing to do with this. The title refers to the conspirators in the scheme and the Wrecker himself, if you come up one short, listen carefully and you’ll discover there was an off screen murder and train wreck they mention that happens before the point where the film starts. Highest recommendations for this first rate comedy mystery. This is how it should be done, smart, witty, and moving at a gallop. Luckily the print available is very good despite being on the “gray” market and you can enjoy it in all its glory. See it. It’s well worth the effort. We saw Cummings in her Tony-winning role on Broadway in Arthur Kopit’s Wings in 1979. I envy you and Jackie for that. She would have been nearly 70 at the time, but she played the role again for a TV version of the play in 1983.
complete with photo of her. Before that she was mentioned in passing in Bill Pronzini’s review of the novel THE HANGOVER MURDERS, by Adam Hobhouse, and the basis for the movie REMEMBER LAST NIGHT?, which she was in. Looking at her IMDB credits, there’s none of her films that I’ve seen recently. Looking at her photo, I think it was a shame that she gave up on Hollywood and went to England, where she concentrated mostly on the stage. 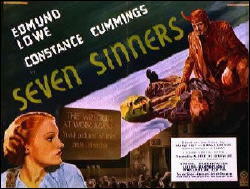 As for SEVEN SINNERS, as I told David in a separate email, it is not difficult to find lots of coverage of it on the Internet. It may be the most famous movie I’d never heard of until David sent me this review. One correction, the novelization (it’s of the play not the film) is by Ruth Alexander, who gets co credit with Ridley for the novelization of GHOST TRAIN. The film and play have little in common but a few elements, with the film much more fun. GHOST TRAIN though is very close to its play form on film. Alexander is also credited with the novelization of Hitchcock’s THE MAN WHO KNEW TOO MUCH (the first version). Gilliatt and Launder also co-wrote Hitchcock’s JAMAICA INN and Carol Reed’s NIGHT TRAINT TO MUNICH among other famous films of the era.